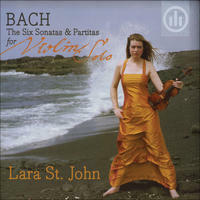 Lara St John: Bach violin concertos. Described as "something of a phenomenon" by The Strad magazine and a "high-powered soloist" by the New York Times, Canadian-born violinist Lara St. John has performed as soloist with the Cleveland Orchestra, the Philadelphia Orchestra, the Toronto Symphony, the Montreal Symphony, the Franz Liszt Chamber Orchestra of Budapest, among many others, and given recitals around the world. The Strad magazine selected her as one of "the stars of the next decade" and called her "an electrifying player, as deeply satisfying in Bach as she is bewitchingly seductive in Waxman's 'Carmen' Fantasy. The L.A. Times has said: "St. John brings to the stage personal charisma, an unflagging musical imagination and genuine passion. 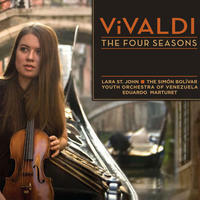 Her two albums to date are bona-fide classics of the violin discography." In January 2002, Lara released her third CD on her own label. Bach: The Concerto Album and has received enthusiastic reviews. Gramophone Magazine placed the disc in its strongly recommended section, and wrote "It is difficult to argue with such a technically dazzling and unfailingly musical interpretation." During 1999/2000 highlights included engagements with the National Arts Centre Orchestra, Seattle Symphony, Vancouver Symphony, Buffalo Philharmonic, Shanghai Broadcasting Symphony, and Edmonton Symphony, while the 2000/01 season brought her debuts with the New Jersey Symphony under Hugh Wolff, the Tokyo Symphony (Paavo Jarvi), Hong Kong Philharmonic, Honolulu Symphony, and Calgary Philharmonic, among others. During last season she debuted with the Cincinnati Symphony, Prague Philharmonia, Sao Paulo Symphony, Opera de Marseille and performs numerous other concerto appareances in Canada and the US, as well as recitals at Ravinia, the Miller Theater in New York, in Montreal, Quebec City, and throughout China. Season 2002/03 continues the array of appearances on the recital stage and as soloist with orchestra, among them the symphonies of Portland, Delaware, Knoxville, the Florida Orchestra, and Northwest Sinfonietta. In addition she will undertake a nation-wide recital tour under the auspices of Community Cocerts. Other future engagements include debuts at Tanglewood with the Boston Pops under Keith Lockhart and performances with the Vancouver Symphony, among others. She has been victorious in several competitions and in 1997 won the use of the 1702 Lyall Stradivarius for two years from the Canada Council for the Arts and an anonymous donor. Upon hearing her audition, the panel of judges exclaimed, "Today we have heard one of the great violinists of our time! Inspirational." Currently, she performs on the 1779 "Salabue" Guadagnini thanks to an anonymous donor and Heinl & Co., Toronto. Lara began playing the violin when she was 2 years old. She first soloed with orchestra at age 5, and made her European debut with the Gulbenkian Orchestra (Lisbon) five years later. She toured Spain, France, Portugal and Hungary at ages 12 and 13, entered the Curtis Institute at 14, and spent her first summer at Marlboro three years later. Upon her graduation from Curtis, at age 17, Lara took off for Moscow to find out if there was really more to life than just music --- there was. At this time, most teachers at the Tchaikovsky Conservatory (including hers) were indefinitely extending their journeys west, and being without a teacher for the first time gave her the opportunity to travel extensively throughout the former Soviet Union and Eastern Europe. She also spent two years in England at the Guildhall school, holds a certificate from the Mannes College in New York City, and an Artist's Diploma from the New England Conservatory in Boston. Her teachers over the years have included Linda Cerone, David Takeno, Arnold Steinhardt, Felix Galimir and Joey Corpus. Lara is a great fan of J.R.R. Tolkien, reptiles, and the American Museum of Natural History. She resides in New York City. Lara St John lives in New York, USA. Tagged as: Classical, Baroque, Orchestral, Instrumental, Composer: Johann Sebastian Bach, Violin.